"And I am sure that, as all pendulums reverse their swing, so eventually will the swollen cities rupture like dehiscent wombs and disperse their children back to the countryside. This prophecy is underwritten by the tendency of the rich to do this already. Where the rich lead, the poor will follow, or try to." In the most recent census, Cleveland’s population had dropped 17% since 2000, putting its size at a level not seen since the turn of two centuries past. Even LeBron James decided to hightail it out of town, choosing to kick the city in the proverbial nuts with his national TV denouncement on his way to SoBe. The “Forest City” cannot seem to catch a break, but somehow those holding out for “The Last Stand” are hanging hopefully on. Jen, the hotel barkeep, wants to take a leave to do charity work in Africa, but is afraid her job won’t be here when she returns. Between Great Lakes pints and a surge of St. Patrick’s Day revelers, I try to tell her a bartender’s job can be found anywhere, but she seems oblivious to this reasoning as she moves down the bar rail. She has roots it seems and doesn’t want to give up a career with this national hotel chain. She has a dream, and it involves this city. Walking down the near-deserted streets the next morning, I notice there are few trees in the “Forest City”. The lakefront is “planes, trains and automobiles”. As I walk past the “Rock and Roll Hall of Fame” and the Browns Stadium, I hear the hopeful sound of jackhammers. A massive convention center is sprouting up. I continue my walk and come upon the historic Warehouse District, a rehabbed entertainment and living area that “resprung” up to replace the crumbling Flats. Heading away from the lake, I find The Q, the site of the NCAA Round 2 & 3 games. Abutting Quicken Arena is Progressive Field, home of the MLB Indians. This newer sports complex is buttressed by the East 4th Street Entertainment District. In another day, I swing by the Market District to check out the Great Lakes Brewery, and I hear and see of an attempted rebirth of another downtown neighborhood. It becomes clear to me that the “Forest” has now become a euphemism for the city planners’ attempt to nourish and grow Barkeep’s Jen’s roots she so passionately describes. 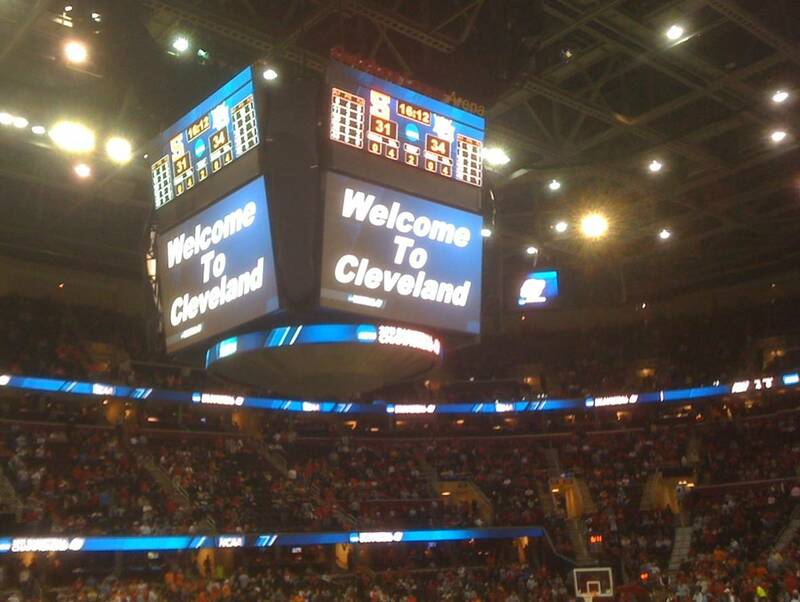 As the NCAA fans stream into the city now, the pendulum of hope appears to be swinging back in Cleveland’s favor. Later on Game Day Friday, I ran into a group of George Mason basketball fans at the hotel bar for lunch, many of whom I am now best friends with from the night before—although I cannot seem to remember their names, except for their unofficial mascot, Father Peter, the GMU priest who is also on Facebook and Twitter. They were definitely the most spirited fans in Cleveland, and certainly the bar friendliest. Barkeep Jen was raking in the quid today as the high priestess of the NCAA basketball TV viewing altar. The Masonites were about to head to The Q to witness their team’s upset of Villanova, and as it turned out, Coach Jim Larranaga’s last win with the Patriots. For me, it was on to the Marquette pep rally at the team hotel where I picked up my tickets and mixed it up with the well-heeled alumni, school officials, and for the first time on the road, students, before sending the team off with some stylin’. Then, it was on to the Ohio State dominated bars to meet up with some in and out of town friends for a pre-game. In the season’s third “Battle of the Jesuits”—all played on the road under my witness— it was my 11th seed Marquette Warriors versus the 6th seed Xavier Musketeers (again, with the violent Jesuit nicknames). To this point in the season, MU was 0-2 against Ignatians and 5-6 against the Catholics. I was ten “Our Father’s” optimistic on this one, though. But, who did Jesus favor in this town called Purgatory? The answer: Jimmy F Butler carried the “Cross of Gold” by completely shutting down Tu Holloway, the Crean refugee and the A-10 Player of the Year. This game was Marquette’s best defensive performance of the year, and they won going away--perhaps putting some doubters to rest. It was Marquette’s first NCAA win since 2009, ending Xavier’s streak of three, straight Sweet 16’s. In the last game of the night, Syracuse trampled Indiana State, setting up a Big East rematch. The cocksure Orange Julius fans were assuring a trollop over the 11th place conference foe in the Round of 32. MU fans were still a bit shaky, to tell the truth. On Saturday, I did some sightseeing, and then met up with some friends at the Cleveland Chop House to watch the NCAA games on HDTV. I ordered the Top Sirloin and an Irish Red as we watched the games on the rail. Regulars kept coming in and toasting Mike the Bartender, but I could not quite figure out why. What I found interesting was that this was a national chain, a type of place locals don’t usually hang at—a place that normally blanches any remnant of personality out of a joint. As Mike served my meal, I asked him “what was the occasion?” He said, “thanks for asking, but I just got engaged last night after my shift”, and he went on to describe the whole proposal set-up with pride. Apparently, he “Facebooked” all this, and the Mike Regulars swarmed in to wish him well, share a toast, and hear his story live. The games, the company, the sirloin, the Irish Reds and Bartender Mike’s hope made my day…and many others. Cleveland was making me more Milwaukee confident…to tell the truth. Sunday started off with the Father Peter “underdog mass” in the hotel ballroom. Brunch followed at the Barley House in the Warehouse District, where I again hooked up with my atheist friends. Besides the Barley Girls, the Bloody Mary’s and Buffalo Chicken Mac & Cheese were great post-Eucharist/pre-NCAA morning starters. The highlight, though, was, hmmm, the posters over the urinals: A model with a faux, split-fingered hand mask. Another had a model with a sly, doubting look on her face, overlooking the male guest at the porcelain monument. I chose, matter-of-factly, the low well under the model with a tape measure. Thank goodness for that liquid courage to set the record straight. Mike Ditka often gets philosophical. When he does, it usually starts with: “Sometimes in life, gang”… or something like that in “tough-as-a fender” talk. Well, I was now “Mike Ditka” sure of a Marquette victory over the Orangemen as I met friends at the pep rally. Why? I don’t know…but it is usually something in the air, an intuition that just overcomes me. Normally, even against a “Wisconsin State Fair Creampuff”, I am a nervous wreck before a game. However, I was a very “detached confident” against Syracuse for some reason. I was just determined to enjoy the ride. It was a bit out-of-body. 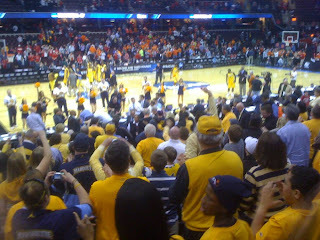 Sitting amongst Marquette player families and girlfriends, I witnessed the nerves, parental pride, and the Marquette spiritual happy ending as the Warriors, emphasis on Warriors, clutched it out via the Jae and DJO treys to beat the Syracuse Metal Heads in a national, but not Milwaukee, stunner. Unfortunately, my GMU friends got the spanking machine in the opener, but Father Peter had done his Catholic duty for the good guys. The Sweet 16 Surprise provided the season-nightcap that the MU fans had expected, deep-down, all along. The Buzzer went stand-bounds to cap off one of the top highlights in Marquette’s basketball history. After high-fiving the Cleveland police force at the exit, it was on to Local Heroes to savor it all with the Marquette Faithful—at least those who didn’t drive back through the night. The pendulum had swung, baby! 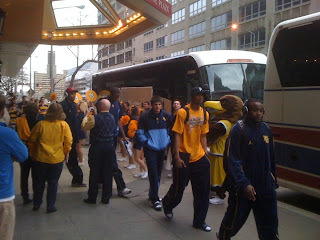 "The Forest City" is the latest in a series chronicling the 2010-2011 Marquette hoops season from a fan's unique perspective. If you missed the first entries click on the tags below for earlier installments.